It is only days away to the start of WESTPEX 2019. Start your plans to attend. WESTPEX is now on Facebook. WESTPEX 2018 Palmares can be found here. Join us at the San Francisco Airport Marriott Waterfront for WESTPEX 2019. 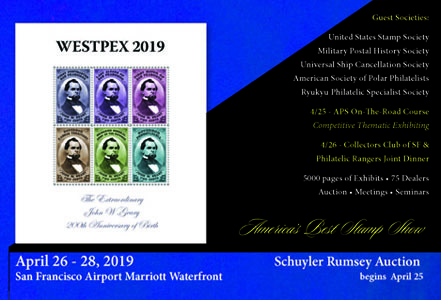 The guest societies helping to celebrate our 59th show in 2019 will be the United States Stamp Society, Military Postal History Society, American Society of Polar Philatelists, Universal Ship Cancellation Society, and Ryukyu Philatelic Specialist Society. The first WSP Virtual Court of Honor was part of WESTPEX 2003. The Nepal and Tibet Philatelic Study Circle provided the images for the WESTPEX 2004 Nepal Showcase. MEPSI provided the images for the WESTPEX 2004 Mexico Showcase. WESTPEX is a registered trademark of WESTPEX, Inc.